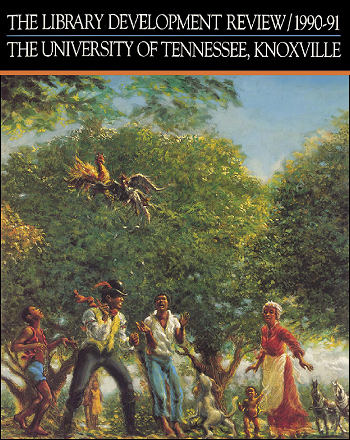 Published in The Library Development Review, Knoxville: University of Tennessee, 1990 / 1991 by James B. Lloyd (Editor) and Laura C. Simic (Assistant Editor). A Word From Alex Haley is brought to you by the University Libraries at Trace: Tennessee Research and Creative Exchange. I have always loved libraries. I like the way they feel. I like to touch the books. The stories and inspiration for Roots came from my grandmother’s front porch in Henning, but libraries helped me make sense out of the stories and fill in the blanks. I quickly found that librarians were my best allies. If they see that you are serious, that you really care about what you’re doing, they will get excited too and join in your quest. One of my favorite stories involves a turtle who winds up on top of a fence post. The point of the story is that you know that turtle couldn’t have gotten there without help. I was like that turtle—I had help. And it’s because libraries and librarians have done so much for me in the past that I am happy to do what I can for them now. My long search for my family has, I suppose, made me aware of the wonderful world that libraries can open up. The folks at UT have become somewhat of an extended family for me. That’s part of the reason my papers are at the UT Libraries. It was emotional for me to give them away—like having a child move away from home. But I am of Tennessee. They came from Tennessee, and this is the only place they should be. Now they’re not just my private works and recollections, but a part of the fabric of our state to eventually be shared with other researchers, writers, explorers and dreamers.